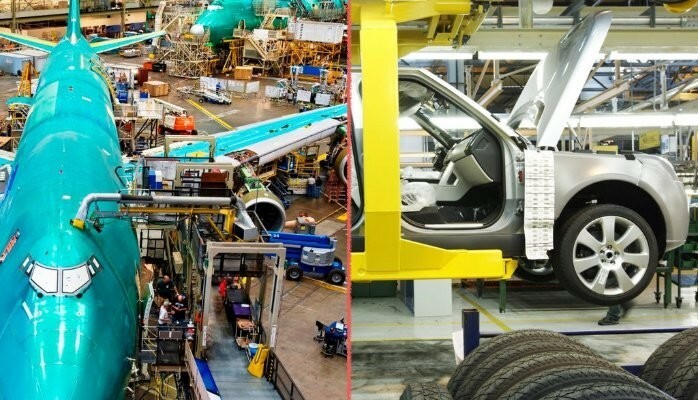 Aerospace and automotive are two major manufacturing industries – also old industries born over a century ago; they have drastically evolved in the past 30 years in terms of product performance, leveraging high technologies and significantly reducing time-to-market. Both industries rely on rigorous quality requirements, advanced materials, electronics and embedded systems, mechanical components, engines, structures, (…) as well as robust New Product Introduction (NPI) and enabling Product Life-cycle Management (PLM). Aerospace is a generic term that includes commercial aircrafts, planes and helicopters, military and defence, ground equipments, and space. The aerospace industry has a strong certification and compliance requirement, with consequences on development cost and technology solutions. The automotive industry require perhaps less formal processes, though there is a significant focus on compliance and regulations. Product configuration management allows to manage new product variants, assembly to order, but also change management and product life-cycle extension through service part management. Material management is bringing huge competitive advantage, and some technologies have been adopted by one industry after the other (e.g. composites, aluminium, etc. ); as such, materials and processes developed by the automotive industry could enable ‘build-rate insensitive, less capital-intensive‘ composites production for the aerospace. Digital manufacturing simulation developed for the automotive are also yet to be leveraged effectively with the aerospace industry; there is a massive opportunity for cross-industry learning. Maintenance, Repair & Overhaul (MRO) is more prominent in the aerospace as aircrafts are required to be operated continuously and be operated for hundred of thousand of hours, compared to thousands of hours only in the automotive industry). Service Life-cycle Management (SLM) in the automotive is more related to regulation and traceability, while the aerospace industry rely massively on it to extend the life-cycle of aircraft and reduce costs. High-rate production means different things: hundred of aircrafts a year vs hundred of cars a day. Other technical domains are very similar, though with different purpose. For example, electronics is a ‘necessary evil‘ for both industries, mandatory to gain and sustain competitive advantage, though not a product in itself. The table below illustrate similarities, differences and areas of similarities between the two industries. Traceability is important when needing to demonstrate compliance to specification (to regulators or customers) or to locate specific parts exhibiting particular symptoms. It is important to be able to track complete part creation history: when it was made, how it was made, what were the requirements, where it was made and by whom (supplier), what components were used, what was changed and why, but also traceability of the complete part validation records: operations status, original test data, intermediate and final test results, certification and compliance reports, test parameters repair records, dependencies, etc. Traceability is also achieved by using serial or part numbers, indicating subcomponents used, tracking machines, shifts and any other elements of the production process; also sometimes by including process signatures for every test, not just as an image file but including all of the data for future review and analysis. Parts and components can be tagged with ships including their relevant history, assembly requirements and instructions, and relevant test data for traceability (so that it is not necessary to retrieve the original database where the information came from in the first place). Another common area between the two industries is a seamless and best in class NPI process and operating framework to manage product portfolio and deliverables. Due to its shorter product development and life-cycle, the automotive industry tends to be hit faster by recessions and economical downturns than the aerospace industry. It is also true that it is able to recover quicker from such crisis for the same reasons. The military and defence sector is however on a different timeframe depending on political and world stability factors which as not always linked to global economy parameters. This post was originally published on LinkedIn on 21 November 2015.